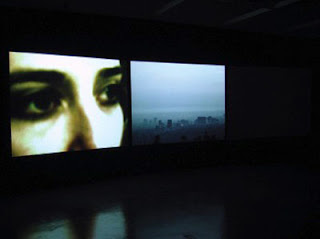 The other day, Melissa Gira posted a link to "Boulevard," a three-channel video installation piece that, as Melissa puts it, is about: "Love, Los Angeles, loss." It's a dreamy, beautiful piece, in which LA serves as a Lynchian landscape for a wandering couple looking for connection amidst the earthquake fractures. In an interview, Horvath discusses webcinema. "I wanted to create a kind of intimate theatre, accessible from the web browser, a dreamlike odyssey that examines multiple states of consciousness within a shadow of family histories."